Chad Waterbury: Bret, thanks for stopping by to talk shop. It’s your first time here. Bret Contreras: Yes it is, Chad, thanks for this interview. I really appreciate it! CW: First off, congrats on achieving a 601-pound deadlift. That’s a strong pull. What is that, about 2.5 times your body weight? BC: Yes, I weighed 236 when I made that pull. I’m the strongest and most muscular I’ve ever been. CW: I know a 601 pull was a new PR for you. What do you feel finally helped you achieve that feat? BC: There are several factors that I feel helped, but the most important is taking advantage of submaximal training. One day, it dawned on me that there were plenty of lifters far stronger than I am who were lifting much lighter relative loads than I typically used. 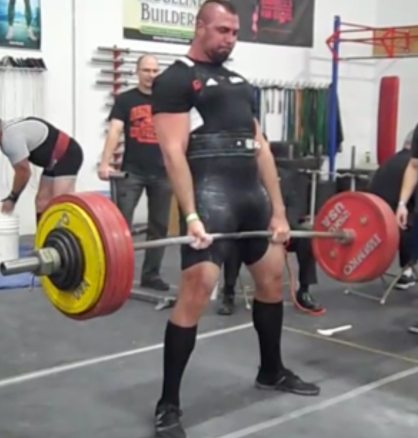 If there are world-renowned powerlifters sticking to 60-80% of 1RM for 1-5 reps, then who am I to think I always need to max out or push every set to failure. I started performing what I call super-strict reps, pause reps, and explosive reps, all done with 60-80% of 1RM for 1-5 reps. These methods are much easier on the CNS than a maximal single or a set taken to momentary muscular failure, and it grooves technique and adds more frequency/volume without compromising recovery. When combined in tandem with maximal training, the submaximal methods provide a one-two punch that really enhances strength development. Imagine that: you get more from doing less. If only I understood this in my twenties. CW: Yep, we all learn that lesson the hard way! I used to go for a new PR in every workout, but that’s a road that quickly leads to burnout. What are the other key elements you learned? BC: I left no stone unturned in my quest for greater strength. What muscles do the most work in a deadlift? Hams? Check. Glutes? Check. Erectors? Check. Quads? Check. Grip? Check. Abs? Check. You get my point. For the first time in 10 years, I started hammering front squats. I fell in love with block pulls. I was a hip thrusting machine. I did heavy back extensions. I was setting squat and deadlift PRs every other week in various rep ranges. It seemed that every lower body lift I did transferred to every other lower body lift. I noticed that if my front squat and hip thrust went up, my squat went up. If my squat went up, my deadlift went up. If my deadlift went up, my back extension went up. I gained steady strength for weeks on end, culminating with a big PR on the day of the meet. CW: That is an important lesson. Building strength with key exercises will carryover to your other lifts. I know these factors led to the creation of your new 2 x 4 strength and muscle-building system. BC: Yes, it did. However, the system kept getting more effective over time. Initially, I felt the early version of 2 x 4 was just too demanding. The people who initially piloted the program were beat down and complaining. So I made changes and I kept tinkering with the system based on feedback from all the lifters implementing the system. We’d have weekly meetings to discuss the system – what was perfect, what needed improvement, etc. The end result is a field-tested system that went through a long, arduous process before it was ever presented to the public. CW: I know that’s true because we were talking about the ways you were tweaking this system with lifters many months ago. Tell us what kind of results those other lifters achieved in your new system. BC: Chad, every lifter who completed 2 x 4 saw huge improvements in strength and physique gains. My female client Sammie finally pulled a 315 lb deadlift weighing 125 pounds. My buddy Rob boosted his raw squat and deadlift to 475 lbs and 585 lbs. And Andrew, his strength went through the roof. His deadlift increased 110 lbs! It’s important to note that I didn’t take on beginners – each of these lifters had many years of lifting experience. Andrew and Rob have competed in powerlifting competitions. They don’t have as much room to gain, but their strength still skyrocketed. Below is a chart summarizing the strength gains. CW: The true measure of any system is how quickly it can develop strength with lifters that are already very strong. 2 x 4 definitely achieves that feat and you’ve earned testimonials for world-record powerlifters. What body composition changes did these lifters experience? BC: They all made outstanding progress. Each of these lifters’ physiques was at its all-time best after completing 2 x 4. There’s a huge correlation between muscle mass and strength. And the stronger you are at a given bodyweight, the leaner you’re going to be as well, so it makes sense to prioritize strength development during a couple of training cycles per year. CW: You’re one of the hardest-working guys I know – constantly researching, experimenting, and blogging. You put a ton of work into the bonuses for 2 x 4, namely the section on biomechanics. Why should people care about biomechanics? BC: Knowledge is power. It wasn’t until I understood biomechanics that I could truly take my training by the reigns and start steering my programming toward success. If you understand how anatomy affects strength on the different lifts, and why form tends to break down in predictable patterns, then you can be proactive in your training and shore up weak links, which makes your training more efficient. Biomechanics is critical when it comes to building strength. CW: It absolutely is, Bret. Thanks for the interview! BC: It was my pleasure, Chad. I give Bret Contreras’ new system, 2 x 4, my highest endorsement. It’s a terrific resource for anyone interested in building strength and muscle. Best of all, you can get 2 x 4 for an introductory sale price today. Just click here to find out more. Any estimation as to the release date of HFT2?